Last year witnessed a shift of approximately a third of a trillion dollars from actively managed funds into index funds. That means in the United States, a massive $350 billion moved straight into index funds. Ever since index funds were created in the stock market, they have consistently outperformed the average managed fund. They have lower charges than managed funds. Warren Buffett, the billionaire investor consistently recommends low cost index funds. In 2007, Warren Buffett made a bet with Protégé Partners, a US based Investment Company, which specialises in investing in hedge funds. The bet was that an index fund would outperform their choice of managed fund. Warren buffet won the $1 million bet as the index fund outperformed Protégé Partners selection of hedge funds. 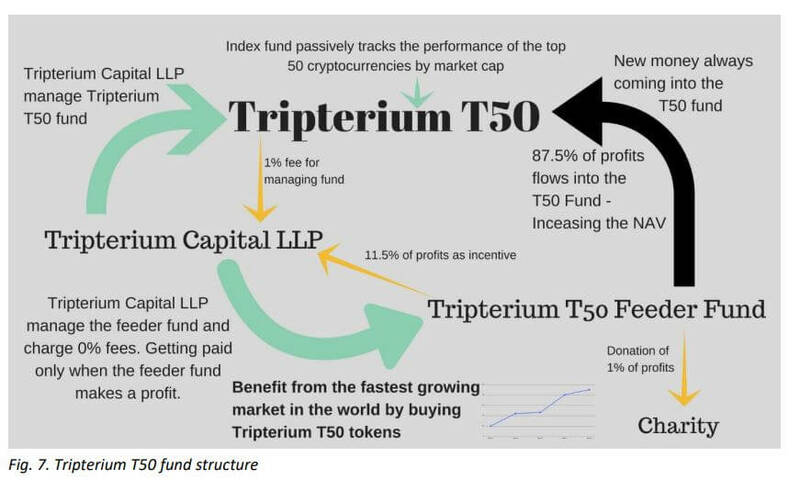 As blockchain technology matures, the Tripterium T50 index fund will simply harness the power of the markets to deliver healthy returns. At the time of writing, the total market cap of the crypto market has been fluctuating around $400 billion2 . This might seem a lot, but when you take into consideration the size of other financial markets it really is not. The dot com bubble at its peak was a $3 trillion market, gold is a $7.7 trillion market, the global stock market is a $73 trillion market, the global real estate market is a $217 trillion market, and the derivatives market is a $544 trillion market. There is room for exponential growth in the crypto market. Only 1% of the world’s population own cryptocurrency. 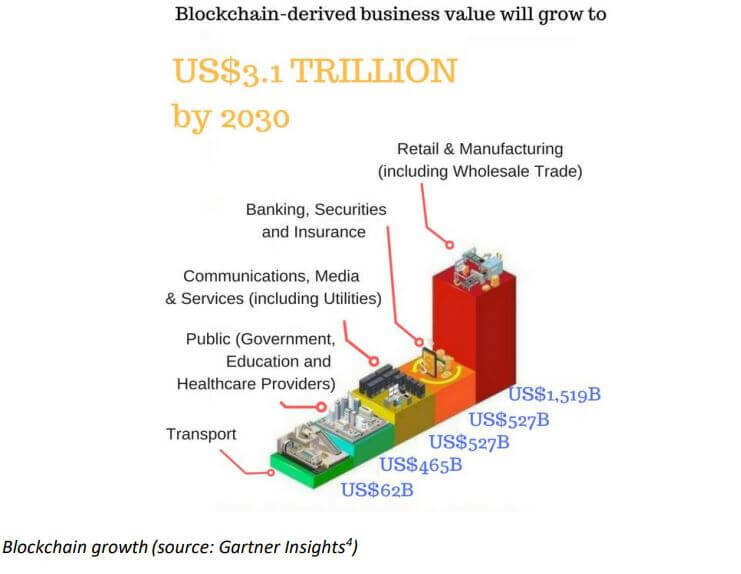 Blockchain technology can solve dozens of previously intractable problems, like digital identities, supply chain integrity, data breaches and many, many more. The use of blockchain technology within society has been exponentially increasing since it was introduced to the world in the whitepaper written by Satoshi Nakamoto . The first use of blockchain technology was bitcoin. 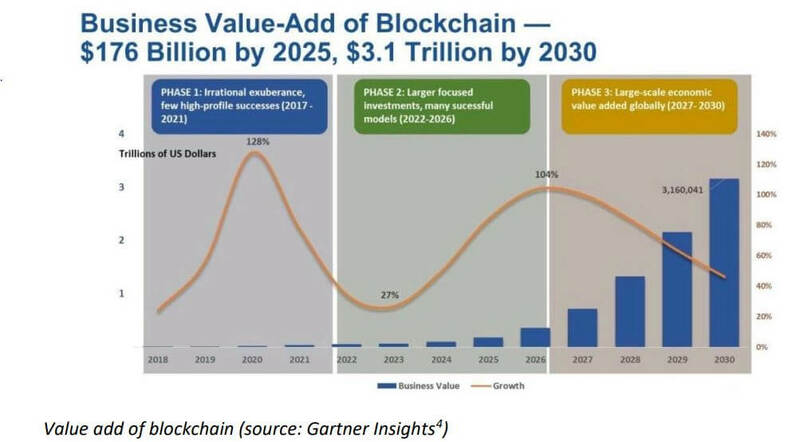 According to Gartner Insights, blockchain, the driving force behind the crypto market is estimated to grow in business value to $3.1 trillion by 2030 . The age of blockchain technology is just beginning. Tripterium T50 has been structured to take advantage of the EMH theory. The T50 index fund will harness the power of the market to deliver returns, while the Venture Capital Feeder Fund will invest in riskier ventures in order to gain from the higher returns associated with them. This allows for Tripterium T50 to consistently outperform the market and benefit from the fastest growing market in the world. The Tripterium Founders’ Club is a unique standalone club that is dedicated to those who share our vision for Tripterium T50 and are optimistic about the crypto market, the fastest growing next generation market in the world. This ensures that the members all share our vision about blockchain and the crypto market, the fastest growing next generation market in the world. There are several components that make up the Tripterium T50 index fund, and one needs to understand each component. Index funds aim to track the performance of a specific index. The value of the index fund will go up or down as the index goes up or down. Index funds typically have lower costs than actively managed funds because the portfolio manager doesn’t have to do as much research or make as many investment decisions. Even if two funds are of the same type, their risk and return characteristics may not be identical. Active management means that the portfolio manager buys and sells investments, attempting to outperform the return of the overall market or another identified benchmark. Passive management involves buying a portfolio of securities designed to track the performance of a benchmark index. The fund’s holdings are only adjusted if there is an adjustment in the components of the index. A closed-end fund (CEF) or closed-ended fund is a collective investment model based on issuing a fixed number of shares which are not redeemable from the fund. Unlike open-end funds, new shares in a closed-end fund are not created by managers to meet demand from investors. Instead, the shares can be purchased and sold only in the market, which is the original design of the mutual fund, which predates open-end mutual funds but offers the same actively-managed pooled investments. Venture capital funds are investment funds that manage the money of investors who seek private equity stakes in start-up and small to medium-sized enterprises with strong growth potential. These investments are generally characterized as high-risk/high-return opportunities. In the past, venture capital investments were only accessible to professional venture capitalists. A tokenized index fund is a new type of investment fund. The Ethereum blockchain provides a trust-less and transparent platform that allows tokens to be easily transferred. This removes the need for a third party to keep track of investment accounts and their investors. Using the Ethereum network, a token holder can trade their token with no entry or exit fee bar the transfer fee charged by the Ethereum network. The T50 tokens represent their share of the underlying assets within the fund.